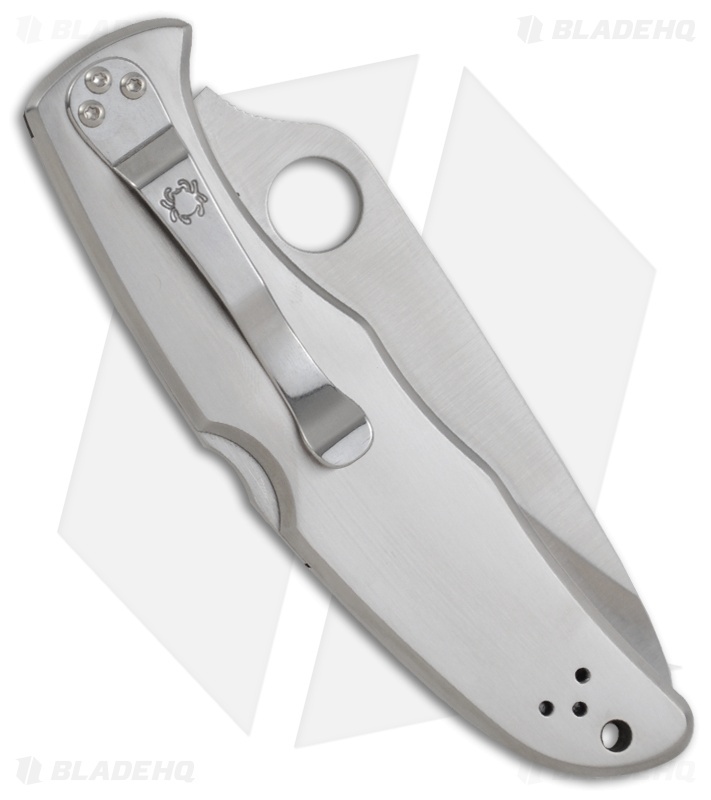 This Spyderco Endura knife has a hollow ground VG-10 stainless steel blade that is satin finished with a plain cutting edge. The handle is stainless steel, offering users a knife with a bit more heft and a flat surface that is ideal for engraving and personalizing your knife. 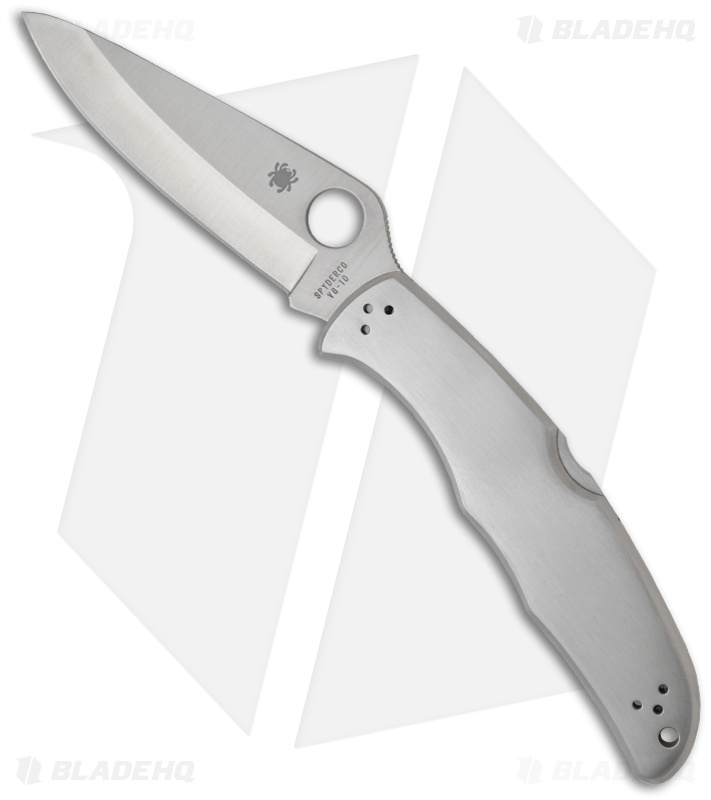 The blade is premium VG-10 stainless steel from Seki-City Japan and has Spyderco's easy to use thumb hole for simple, efficient one-hand opening. Phosphor bronze bushings on the blade pivot smooth out the open/close action. The pocket clip is four-way reversible for tip-up/down, left- or right-handed carry. Bought one of these awhile back and used it for everyday carry. Very durable and always held a good edge. Got a new knife so put this one in the gun safe. In 2017 lost our house to a wild fire. Gun safe failed, lost all the guns and multiple other knives inside the safe. Picked up the spyderco and it still functioned like it should. Cleaned it up and is now my EDC again. Still holds an edge and is a smooth opener. The patina is unlike any other too haha. But being the only knife to come out and work like it should is impressive. My go-to work knife. Not scared of messing it up or breaking it. 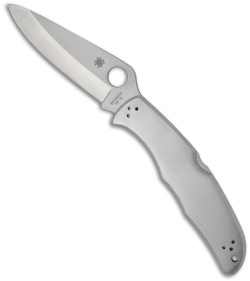 Really hard to go wrong with Spyderco, consistent quality and just super functional knives. This may have been my first "nice" knife that I purchased. It is a great size, though the blade may be a bit too large to be legal in a few places. I carried it quite a bit, it is very thin, but also a bit heavy. Pros: Super thin, great edge retention on the steel. Smooth action. I bought this knife with the intention of getting it engraved but I never did other than that the Endura 4 is a great knife. Great size, blade feels good in your hand. I would give this knife 5 Stars if it was the handle was the FRN version. Well.. To start with, it's a Spyderco. BHQ's Shipping was fast as always, and out of the box it passed the "cleanly shaved the non dominant wrist/forearm hair" test, and stayed sharp as a razor for months. I have cut everything under the sun over the past year, and not shied away from letting the Endura tackle any task from your basic corrugated cardboard boxes as well as zillions of 175lb rated zip ties, loads of the green bands around palates of brick and cinderblock, whittling, carving, steak cutting, throwing it into wooden block targets, and even chopped down a small tree (wearing gloves and safety glasses, using a small log as a hammer). Three passes through the "Fine" side of a Smth's Pocket Pal and a dab of oil every two or three months is the only maintenance that has been required thus far, and the Endura still performs and functions like the moment it came out of the box a little over one full year ago (original purchase date 2/09/2016). Lockup is still rock solid, still ZERO blade play, takes an easy razor's edge, and not so much as a bent, much less broken, tip. 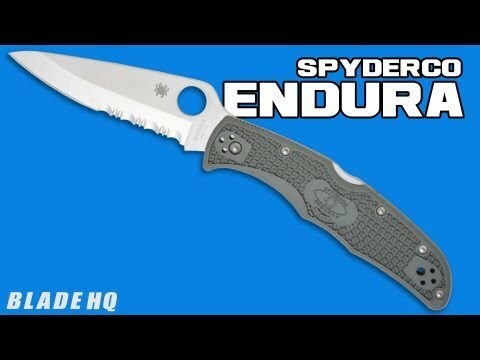 All of the performance one expects out of a Spyderco, to be sure. I chose the SS scaled model as opposed to the FRN because I often carry a pocket knife in dress pants/khakis, and after my Emerson CQC-7BW ate through four different pairs of pants (khakis, dress slacks, jeans, and a well worn pair of 5.11's) I figured this would be best. It's sleek and smooth to be sure, but I have never had a problem (even with wet/dirty hands) with achieving the desired grip/closing the knife in smooth transition, and it has never ONCE slid out of my pocket-not even out of the slick, relatively thin pockets of a Super 200 Wool suit, nor in gym shorts. Ultimately, the scales are a matter of preference, but this model has been wonderful for and to me. Would recommend 10/10: if you're new to Spyderco, just buy it. You'll immediately feel and see the difference. 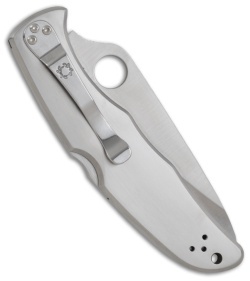 If you're not new to Spyderco, then you both know how perfect this knife is and probably stopped reading long ago and just bought it. Either way, good call!